People, files, locations, events, tasks, portfolios, financials, organizations, policies, questions, problems, tags, sensors, and on and on. Everything relating to that object is attached and can be easily collaborated upon. 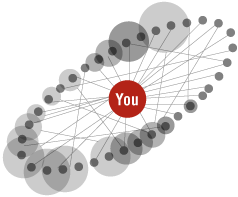 You will see all related connections instead of just the ones you stumble upon, giving you better organizational capability, saving time, money and frustration in connecting it all together. Because your knowledge and applications exist in one ontology, the system learns by watching the knowledge in use. This allows for much greater learning and intelligence with less time and effort and less guesswork. Yesterday's successful results are automatically available as tomorrow's best practices. information linked or commented on in real time.